Home » Inspire » Floyd Mayweather Jr.
Floyd Mayweather Jr. was born on February 24, 1977, to Floyd Mayweather Sr. and Deborah. Boxing is in his blood because his father Floyd Mayweather Sr.was a former welterweight contender and his Uncles Jeff and Roger Mayweather were professional boxers. Floyd Joy Mayweather Jr. is an American professional boxer, who competed from 1996 to 2015, and currently works as a boxing promoter. Floyd Mayweather is regarded as one of the great pound-for-pound fighters in the history because of his speed, power, and technical prowess. At an early age his father introduced him to the gym. Within a short time Mayweather was throwing punches at anything that came in his view. When he turned seven, he was fitted for his first pair of boxing gloves. Mayweather’s grandmother who first noticed his potential advised him not to look for a job but keep boxing and concentrate on his boxing skills. Mayweather eventually decided to quit school and make boxing a full time career. His early life was very complicated. In 1993 his father was sentenced to prison on cocaine trafficking charges. After that he was staying with his mother in New Jersey; they were so poor that there were seven of them, all of whom were crammed in just one bedroom. His mother also became an addict and his aunt died of AIDS disease due to intravenous transfusion of contaminated blood into her body. In spite of his family issues, Mayweather found peace and control in the ring. During his younger years he was known as “Pretty boy” for his unmarked face. As an amateur, he won the national Golden Gloves in 1993, 1994, and 1996 with his fast, precise style. Mayweather's pre-professional career came on a bitter note at the 1996 Olympic Games in Atlanta, when he lost a controversial decision to Bulgaria's Serafim Todorov and was forced to settle for a bronze medal in featherweight semifinals division. On October 11, 1996, Mayweather turned as pro. His father served as his manager and trainer after his release from prison. In first two years as, pro he won many bouts. He went on to fight at five separate weight divisions in his career, winning world titles in all of those divisions and collecting 15 title belts overall. He became the first U.S. Olympian to win a world boxing title in 1996. He won his very first world title the WBC super featherweight championship in 1998, WBC lightweight title in 2002, the WBC super lightweight title in 2005 and the IBF, IBO, WBC and IBA welterweight titles in 2006. In 2007 he defeated Oscar De La Hoya for the WBC super welterweight crown. He was engaged to Shantel Jackson, but the couple broke up before tying the knot. 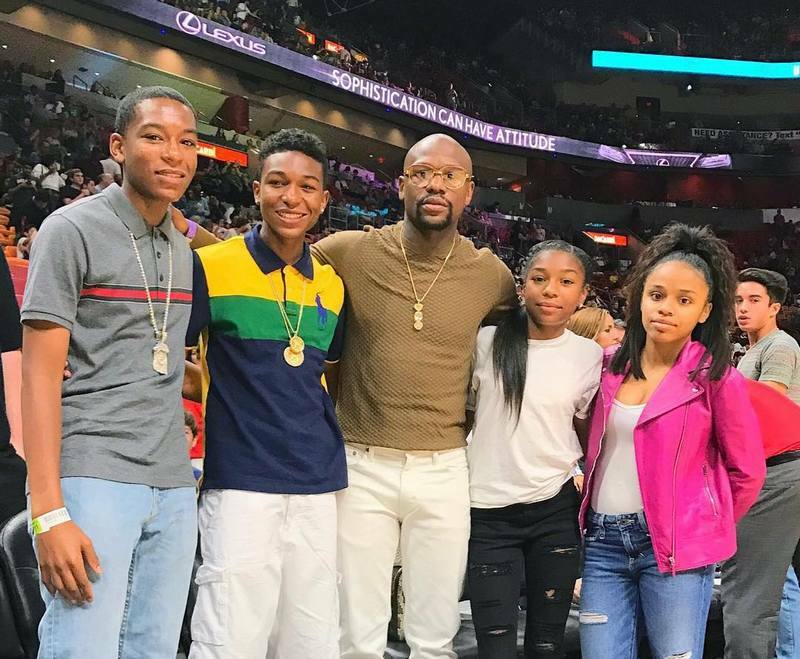 Floyd Mayweather is a father of four children. He currently lives in Las Vegas. Since 2002, he was arrested numerous times even for battery and violence. In 2011 December, he was convicted to 90 days in jail after pleading guilty on a domestic violence charge.